We are super excited that Fabian Pfleger has been selected to be part of the exhibition "Junge Künstler der Kunstakademie Düsseldorf" in Kaarst. Join us on Sunday 6th of March for the opening at 12pm. Zona Maco - Mexico's number one art fair just closed its doors a few days ago. If you didn't have the chance to visit the fair, Alexandra our Art Ambassador living in Mexico City went to see the show. An amusing anecdote might be that while I was happily dancing away to those aforementioned funky tunes, I found myself next to a very well-dressed man wearing a... turban! Considering the utter lack of turban-wearing people in Mexico, his presence clearly caught my eye. Three days later, the same turban-wearing man, who I then found out was a kind of famous actor/style icon/designer, become an overnight news sensation when he was denied access to an Aeromexico flight. Turns out the man had several cameos in Wes Anderson movies, and had once starred in a GAP ad. And now he had found his vocation in defending the rights of the world’s plentiful Sikhs who suffer from racism. An undoubtedly worthwhile cause, but I could not help but notice the irony. Zona Maco, having been bred and born in Mexico City, carries that very same element of surrealism the capital also exudes. The magical city of Venice always surprises me. A few days ago I was wandering through the little allies, crossing bridges and passing San Marco square to meet a friend of mine at Hotel Danieli. The hotel is already overwhelmingly beautiful with its Venetian arquitecture and currently a very inspiring exhibition "Forgotten Spaces. All that is left behind" by Chiara Cocchi fills the entrance hall of the hotel and is exposed on many different levels of the building. "Venice is a special place where people and emotions interwine just like the flow of the waters amidst the lagoon's canals. Venice is a mystery fascinates and brings similar souls closer together", as Antonello De Medici puts it. During that afternoon Chiara, better known as Penelope and I run into each other trough a great coincidence, which life often offers to us. Penelope's exhibition exposes us to unseen and undiscovered places of Venice, which gives us an entire new perspective of the lagoon city. New light is shed on unconventional sites of Venice while recalling themes of a secret and mysterious world. She describes her extensive research for the exhibition as fascinating and a great adventure. Penelope studied in Bologna and was new to Venice. Her curious character allowed her to be immersed into a parallel world in Venice, which lives according to its own rules and time. "Art finds it deepest value when it is the authentic expression of a deep human experience. Art become profound when it exposes us, explains us, or inspires us", Erwin Raphael McManus. "Forgotten Spaces. All that is left behind" gives reason to deep authentic expressions of Penelope's intimate and inspiring travel through Venice. I'm very grateful for the encounter with Penelope. As it left a true inspirational spark. Schiller Solo Exhibition by Birgit Wolfram and Grand Opening of Kajo Collection a Venezia. We are incredibly grateful for numerous articles that have been published on Birgit Wolfram's Solo Exhibition Schiller and Kajo Collection's Grand Opening in Venice. 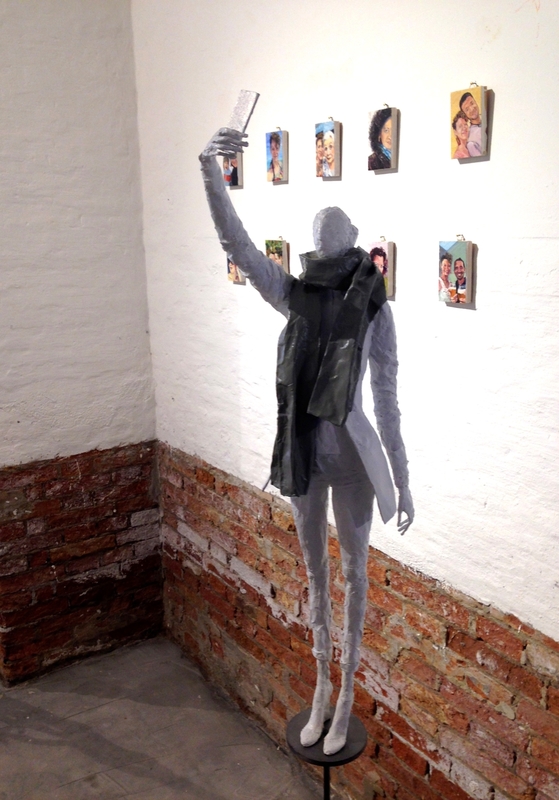 On Wednesday 15th of July Fractal Identities opened at the Venice Art House. The exhibition is on display until 25th of July. Luca Curci, Director of It's Liquid Group and International ArtExpo, has created a global platform for contemporary art, architecture and design. I am very grateful for the truly fascinating conversation we had, which is the beginning of a long lasting dialogue. Thank you Luca. Brown's mixed media sculpture will be shown in Berlin this summer. Save the date 7.8.2015. More information is about to follow soon.